Lean Commerce allows retailers to modernize their supply chain to strip resource-heavy and outdated integrations. We do this by breaking requirements down and anticipating requirement changes. Traditional weighty platforms do not get integrations completed quickly enough and follow the outline of exchanging business requirements, connecting to the data systems, testing and go live. What happens when a change arises? This can derail the integration and cause the project to drag on over the course of weeks, if not months. Since Lean Commerce anticipates requirement changes, essentially, we figure out what part of the integration the change effects and work around that. This shaves off lots of potential lost time, as the project does not need to come to a grinding halt while the bug is identified and fixed. 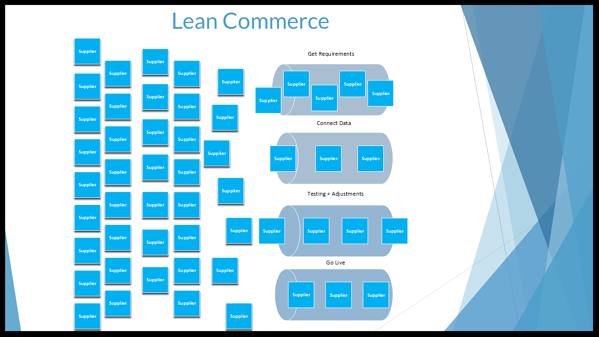 Who should implement Lean Commerce? If you want to have your vendors quickly onboarded, then Lean Commerce solution is for you. Our solution avoids custom mapping by leveraging our certified channel integrations, which allows for work to be quickly replicated. Before we start any implementation, we provide comprehensive documentation upfront which minimizes phone calls and empowers you. Waiting to tackle end-to-end testing at completion wastes too much time. We test as requirements are completed to check for accuracy and. When we do end-to end-testing at the end of the integration, we are not looking for bugs, we are looking for one final validation. Our powerful user interfaces allows less technical people to perform technical tasks. Since the portal interface is so user-friendly, you do not need to learn code to effectively navigate the platform. The ease of automation the Logicbroker platform brings enables your team to run efficiently and add more vendors without needing to add headcount. 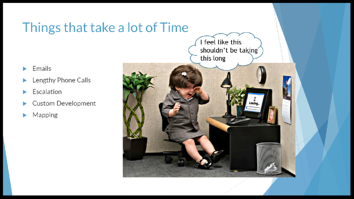 You can maintain a lean, efficient team while applying a modern approach to EDI. Want to learn more. Check out our Lean Commerce Tech Talk video.